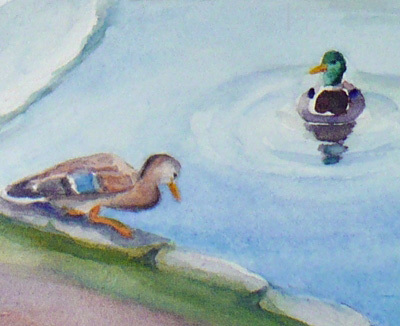 This watercolor painting is a companion piece to the boy chasing ducks painting I completed earlier. 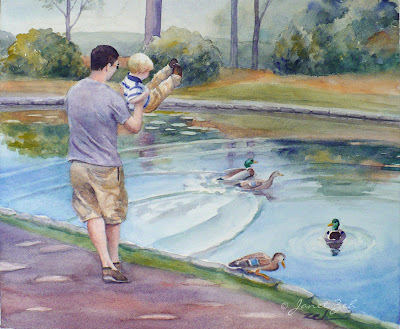 The little blond toddler in these two custom paintings chased some ducks almost right into the pond! 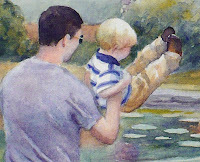 Fortunately, his dad was close by and swooped him up in the nick of time. 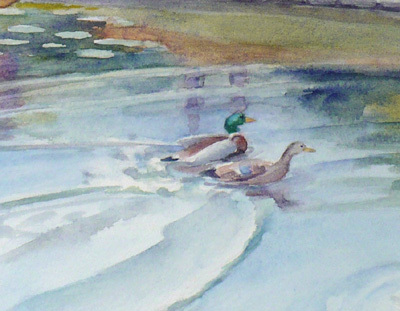 The two that had been chased barely had time to get into the water. The male took the plunge, but his female friend was still thinking about it. I can just hear him saying, "Come on, what's the hold up?" Below is the full painting. These two pieces make a charming story and were great fun to paint. I hope the family who ordered them enjoys the paintings too!